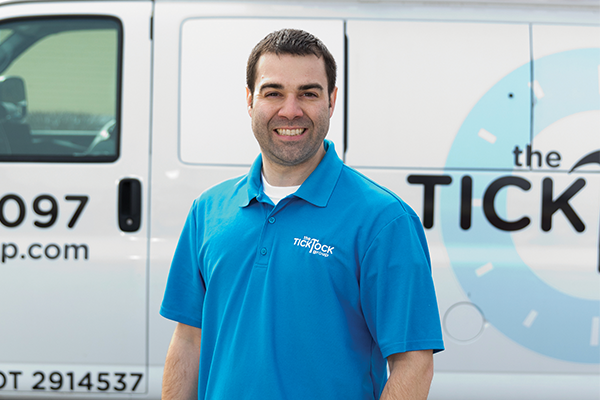 I realized there had to be a better way to offer excellent service and quality workmanship than what people were getting and what I was seeing,” said Corey Boire, founder of the Tick Tock Group, an innovative home and office repair company. Funded in part by a microenterprise grant from the Town of Plattsburgh, the company started operations in August 2016, and offers a wide range of residential and commercial repair, installation, and maintenance services. Because the Tick Tock Group specializes in minor construction tasks that take from two hours to one week—tasks that a larger contractor might not be able to service efficiently—its customers don’t have to rely on the traditional “handyman” (who may have a narrow range of expertise) or call multiple services and pay separate fees to have numerous crews in and out of their homes or offices. According to recent U.S. Census data, the number of residents over age 65 has grown from 35 million in 2000 to 49 million in 2016. As a result, this age group now comprises more than 15 percent of the total population. As the population ages, older people will be less inclined and less able to maintain their homes. Homes are aging as well. In 2017, the median age of American houses was 36 years, but the median age of houses in the Northeast is 51 years. In fact, 14 percent of homes in the Northeast were built before 1919. Houses from that era had single-pane glass windows and wood doors. Decades ago a large percentage of the population was blue collar workers who had the skills to fix things themselves or knew someone in the neighborhood they could call to do repairs. Few women worked, so they were home all day and had more time to find handymen, call them for work, wait for them to arrive, and had more flexibility if the handyman had to reschedule. Today, the do-it-yourself approach to home repairs is plummeting. A significant proportion of Americans are white-collar workers. With the average American family having—by some estimates—only 16 hours a week of leisure time, homeowners don’t have the time or the skills to do remodeling projects. Furthermore, over 60 percent of American women now work outside the home. There are very few houses with someone home all day, available to wait for a handyperson. This is where the Tick Tock Group comes in. “We want to give our customers quality work, and, more importantly, give them back their time,” said Boire. After working for JFP for five years, Boire met his future wife, Abby, a native of Saranac. They moved to Syracuse so she could complete her residency as a pharmacist. They stayed until 2014 when, along with their young child, they returned to the North Country to be near family. While in Syracuse, Boire expanded and honed his skills working for various companies, including Hayner Hoyt, a heavy commercial general contractor, and later a small electrical contractor. Once back in the North Country, he continued with the electrical company installing cell phone towers all over North America. “I have been lucky enough to learn from many good people,” he emphasized. Along the way, he became a certified electrical inspector covering Clinton, Franklin, and Essex Counties. What he encountered on that job was an eye-opener. “I entered many people’s homes and was dismayed at the quality of work being done, and what people—due to their lack of knowledge—were being forced to accept. I realized there had to be a way to offer better service and quality,” he said. In response to the changing demographics and home repair and maintenance needs of North Country residents, Boire employs a group of tradespeople skilled in carpentry, heating and air conditioning, electrical, and plumbing. This group of 30-somethings collaborates with a project manager, scheduler, and administrative staff to diagnose and repair or complete any issue a homeowner or business owner might have. As an added benefit, clients may also enroll in a club service for their heating and air conditioning, plumbing, and electrical systems, and also get yearly preventative maintenance for their furnaces. Over the last 18 months, Boire’s staff has grown from 3 to 18 employees. “There is a lot of experience in our group,” Boire related. “Collectively, we have a huge knowledge base. We have a select group that cares very much about the final product; we mesh very well together. Our group consists of another, and I allow them to take their own approach within our stringent quality controls. To keep their skills sharp, employees receive regular training on expectations, building codes, and quality control. Product manufacturers, such as Tyvek, offer additional training on how to use their products, and local supply houses (the Tick Tock Group uses all of them) also provide training as needed. Boire estimates that 50 percent of the Tick Tock Group’s business comes from word of mouth. The rest comes from social media marketing (Facebook, Instagram, a Google page) expertly handled by Charles Tagliarino of Growtrends. The Boire Benner Group assisted with the company name and logo, initial branding, website, and its color scheme. Potential customers can enter their questions directly into the website and receive an answer the same day.